Twelve-year-old Leslie Mezei, a lively, curious boy, doesn’t realize how precarious his life is as a Jew in German-occupied Hungary in 1944. His older sister Magda, aware of the growing danger from Nazis and Hungarian fascists, takes charge and bravely tries to direct the family’s survival, while his sister Klari, tough and determined, faces a brutal ordeal of her own. Confronting deportation, concentration camps and the constant threat of capture, the Mezei siblings carefully navigate the treacherous landscape of wartime Hungary. And I replied cockily, “To err is human,” and walked out to freedom. I was so proud of my cleverness that this story later became my first piece of published writing, in my high school yearbook. It is only in the last few years that I allowed myself to realize how close I was to being taken away by the Hungarian soldiers; my family would never have found out what had happened to me. There were many close calls, and I think it took quick thinking and miraculous escapes to survive those times, as well as a strong will to live. But I was not aware of these things at the time. We all just did what we had to. Leslie Mezei was born on July 9, 1931, in Gödöllő, Hungary. In 1948 Leslie arrived in Canada, where he completed high school and then graduated with a bachelor’s in mathematics and physics from McGill University and a master’s in meteorology from the University of Toronto. After working as a systems analyst and manager from 1955–1965, Leslie became a professor of computer science at the University of Toronto. An early pioneer in the field of computer art, Leslie’s articles were regularly published in Computers and Automation and Artscanada. He also developed two new graphic programming languages and produced innovative computer art, which was exhibited internationally. Leslie married Annie Wasserman in 1953 and raised two children with her before she passed away in 1977. Leslie now lives with his wife, Kathy, in Toronto, where he is involved in an interfaith and interspiritual movement, the mission of which is to promote a message of unity in diversity, and he published the Interfaith Unity News for a number of years. The evening is in honour of Leslie’s publication and to commemorate the 75th anniversary of the German invasion of Hungary. 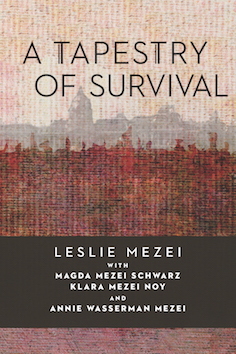 We are pleased to invite you to the launch of Leslie Mezei’s memoir, “A Tapestry of Survival,” which will take place at the Aga Khan Museum on March 26 at 7:30 p.m. We look forward to seeing you there! Audience members will receive a copy of Leslie’s memoir. Admission and parking are free. Even in the years surrounding and during the Holocaust, one of the most explicitly hate-filled periods of history, love found a way to flourish in many people’s lives. Sixteen-year-old Elly Gotz hides with his family in an underground bunker in the Kovno ghetto in Lithuania, prepared to die rather than be found by the Nazis. After surviving three years in the ghetto, where thousands from his community have been murdered, Elly and his family refuse to be the Nazis’ next victims. But there is no escape from the ghetto’s liquidation in the summer of 1944, and Elly and his family eventually surrender, only to be separated when he and his father are taken to the notorious Dachau concentration camp.